Shade variation is one of the common problems found in garments that are made of dyed or printed fabrics. A garment with shade variation is considered as a faulty garment. Shade variation in a garment is occurred when different garment components have different depth of colors (shade) or mismatch of shades in garment parts of a same garment. Shade variation in garment comes due to shade variation in fabric of an order. Most of the time shade variation happened due mishandling of fabric rolls during cutting fabrics and bundles in sewing floor. Shade variation in garments is caused mainly due to fabric problem. Then why varied shades of fabrics are sourced by garment manufacturers? Fabrics are dyed in dyeing machine that has a certain capacity of dyeing fabrics at a time. So, where fabrics are dyed in multiple lots, there is chance of having shade variation between different fabric lots if dyeing process is not controlled. Shade variation in garments (between different components of the same garment) can be controlled if a SOP is set and employees follow that SOP to reduce shade variation in garments. From fabric inspection to garment finishing in each step you have to be pro-active and take action to prevent shade variation in finished garments. Considering that you can't do much in fabric quality. In such situation how to eliminate or reduce shade variation in garments? 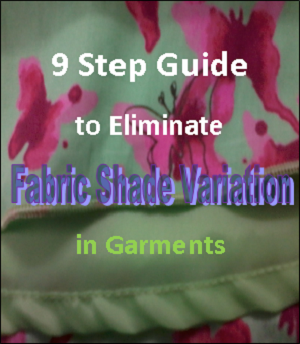 In this article I will show you step by step guides and give you tips to eliminate or at least you can reduce shade variation in garment production. Fabric inspection: Whether it is in-house dyeing or dyed fabric from outside processors, all fabric rolls need to inspect for shade variation. Categorize fabric rolls based on fabric shades. If there is a wide range of shade variation and fabric shade is out of the standard one, you can reject that lot and sent back rejected to your fabric processors for re-processing. Preparing Shade band: Develop shade bands and get approval for all shade bands you have in your bulk fabric. Mark shade band no. to each fabric roll / than. Shade bands help in fabric layering and shorting in cutting room. Communicate with clear information: When you have an order with varied shades of fabrics, information must be shared with cutting department as well as production department. While issuing fabric to cutting, intimate cutting department that fabric has different shades and fabric lots should not be get mixed. Fabric layering: As advised in point#2, you have to categorize rolls according to shade band. While spreading fabrics for cutting, spread fabrics of same shade band no. in a lay. Don't mix fabrics roll of different shades. When you need to spread fabric of another shade on the same lay place separator to identify cutting of different rolls easily at the time of shorting and bundling. Bundle movement in sewing: After following above steps strictly, one even have shade variation in garment if bundles are not maintained in sewing lines. Sewing operators need to close bundles after completing sewing of a bundle. Ensure that when operators join two component they should check ply number on sticker and sew component with same ply numbers. Replace defective garment part: Check garment component shade variation at the end of line inspection (at the end of sewing process). Garments found with fabric shade variation (varied shade of different components if that is not a design feature) need to be separated from the good garments. Later defective garments (due to shade variation) can be corrected by replacing parts. For the part changing, be careful to cut parts from the matching lots. Single piece garment bundling: If you can't stop ply mixing in sewing you can introduce single piece bundle system in production. In this system, there is no way to sew garment components form different fabric plies. I am not suggesting you to change your bundling system but just showing you an option for getting rid off shade variation problem in finished garments. Above steps are not difficult to implement in garment production. Try it yourself and share with us how you have improved and handled shade variation issue in your factory. Steps to take to eliminate shade variation.